Math Dice (a fairly basic game with some potential to support student exploration in the classroom). Cute Math looks like it has some potential for preschoolers. MakeNum - seems OK, but I have only looked at the light version so far. For basic fact flashcard apps I like the Brain Blaze series - not perfect, but better than most - especially the progress screens. Another neat app is the Bell Curve. It's not a game but as a tool to understand the relationships associated with the bell curve it's cool. Touch Physics is a fun physics related game - gravity, levers, etc. Number Line challenges players to sort out a set of decimals, fractions and percents. Codewords is an interesting challenge - another app I'd like to take into the classroom for a discovery learning lesson. Parking lot is a good problem solving game. Word Party is a good fun 'guess my word' game for a small group. Catch a mouse is a fun problem solving game and may even have some potential for supporting a discussion on graph theory. Lemonade is a classic app that can help students to begin to understand the potentials and complexities that develop when you can manipulate more than one variable - but I haven't had a chance to form any judgement on this version. Finally,Zentomino and Tanzen are neat puzzle games that support spatial reasoning and development of geometry sense. I don't have a favorite calculator - any suggestions? The Nine Gaps game has been around for a couple of months now, and has managed to climb up near to the top of the heap in math applications. Indeed, as I browse through the 10 math apps above it, I think it deserves to be on top. In the game, the player is challenged to position the digits 1 through 9 onto a 3x3 equation grid such that all of the equations formed (horizontal and vertical) are true. Although it has a passing similarity to Sudoku – it is much more worthwhile. The user interface is clean and simple and a pleasure to use. Everything seems to work as it should and players are never distracted by the interface as they work on solving the puzzle. I like Nine Gaps because it is a creative game that challenges the player to problem solve and think through multiple possible expressions as they search for solutions for each of the 6 equations on the board. It provides simple but very effective feedback in the form of sounds (positive and negative) and color (green means the completed equation is true and red means that the completed equation is false). The goal is to minimize the time taken to complete the game, but because players can’t really achieve a good time by grinding or guessing, they are encouraged to think through their choices systematically and even undo correct equations if further explorations identify a dead end. This type of game – where the players are challenged to examine and evaluate the multiple possible expressions is a great tool for helping students to think logically, refine accuracy and build fluency in basic facts. 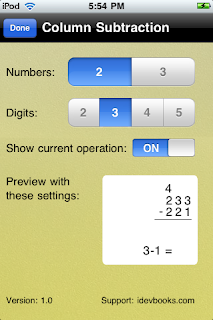 The only gripe that I have with Nine Gaps app is that the order of operations convention is not followed. Players are forced to ignore the precedence rules and follow the game rule of calculating from right to left or top to bottom. Although this quirk may not a big problem for adults who have mastered the convention or even perhaps only minimally so for children who have not yet been introduced to it, it may be distracting and unhelpful to students who are just learning to apply such (typically ages 11-12). Perhaps the authors of this program could add a setting whereby parentheses could optionally be included on the game board to support the learning of this important convention. Nine Gaps has 3 levels of play - the easiest mode gives you a bit of a hint by preloading two of the digits onto the grid in order to provide the player with an obvious next step. At the medium level, a single digit is preloaded into the grid providing the player with two expressions missing only two values reducing the number of combinations that must be tried in order to discover the first workable guess. Finally, the hardest level leaves all 9 positions unfilled – giving the player no explicit hints. As a math teacher educator, I see Nine Gaps as something much better than a flashcard program for learning basic facts. It is a great tool to offer to teachers and parents seeking to help children to improve their accuracy and fluency with basic facts while simultaneously promoting the development of problem solving and reasoning skills. I’m impressed with Nine Gaps and I intend to keep it on my Touch for a while. I have been rummaging through the ~65000 apps recently reported to be available on Apple's App Store and have found a few apps that I think deserve further investigation. But before I move onto my next reviews I decided to survey the field with respect to math and education. Note that some apps will have more that one of these terms in their description and that not all of these apps will be directly related to mathematics education or found in the Education category. the rest were games, manipulatives, and explorations. However, only about 1% of the top educational apps that I scanned met the penultimate threshold of approval – i.e., I decided to load them on my iPod Touch to examine them further. If we extrapolate from the apps that I scanned and generously assume that I will find a similar proportion of interesting apps throughout this category, then we might expect that I would find about 40 interesting apps for mathematics education (along with a few other relevant apps in other categories). This is probably a reasonable number especially given that I’m not particularly keen on most of the drill, utility, and reference apps that I have seen thus far, and because I only need one or two calculators. The apps that are the most interesting to me are those that go beyond looking things up, memorizing facts and procedures, or calculating without understanding. 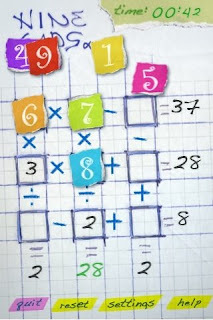 I'm looking for apps that seem to have the potential to help children and adults to explore, make sense of, apply and enjoy math. I’m looking for apps that I (and others) might use in the classroom to support exploration, discovery, discussion and application. I’m a philomath and I’m looking for apps that might spark a similar love of learning in others.